View More In Diaper Changing Kits. The Boutique Baby portable diaper changing organizer inner liner is made with the highest quality PEVA material that is soft to your baby's skin. The outer fabric is made with the highest quality polyester that is durable but very soft. As a busy mom or dad, you are always on the go. Now you don't have to take that oversized diaper bag with you when you just want to run to the store or to the park. Multiple zippered and mesh pouches are perfect for storing baby essentials including diapers, wipes, and toys. The front outer zipper is a convenient place to store your smartphone or car keys. Two straps are included for convenience. The unfolded baby changing pad is extra long and the padded headrest is positioned to maximize the length of the mat to extend the life of your Boutique Baby changing pad. Add the Boutique Baby diaper changing pad to your gift registry for your upcoming baby shower. Or give this functional and versatile gift to that expecting mom in your life. 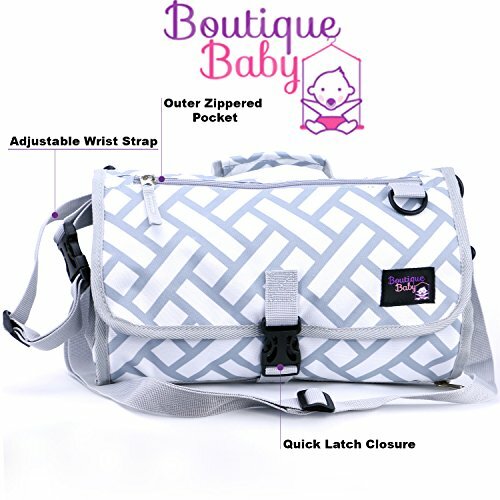 REPLACE DIAPER BAG...Best solution for busy moms and dads. ATTACH TO STROLLER...Or wear over your shoulder. Best combination of style, comfort, and convenience. PERFECT AS A GIFT... Great addition to a gift registry or a baby shower. If you have any questions about this product by Boutique Baby, contact us by completing and submitting the form below. If you are looking for a specif part number, please include it with your message.